Ask your Travel Agent to call RUSSIAN NATIONAL GROUP. A deposit of $250 per person is required at the time of booking. Booking will be confirmed only upon receipt of deposit. Make checks payable to RUSSIAN NATIONAL GROUP. The fares are based on current air tariffs that are subject to change without notice. Land prices are those in effect when this brochure was printed. All prices are subject to change without notice but are guaranteed on deposit. FARES: Most discount fares involve certain restrictions. A change in carrier(s), flight(s), and time or routing could result in a carrier demanding a full fare. We reserve the right to change processing fees in the event of refund, cancellations or special services. Most tickets have value. Any unused flight coupons must be returned in order to determine refund value. Lost, stolen or destroyed tickets must be paid for until refund is received from issuing carrier, subject to an airline-imposed service charge. Group fares are based on a minimum number of passengers traveling; if the number of passengers falls below the minimum required, a surcharge may be imposed on all passengers. GENERAL: All cancellations must be made in writing. The date of the cancellation shall be the date when the written notice is received by RUSSIAN NATIONAL GROUP (during normal business hours Monday – Friday). All cancellation rules will apply in the event the authorities deny your visa .It is strongly recommended that passengers purchase separate cancellation insurance to protect themselves against possible losses due to their own decision to cancel. All cancellations are subject to a $50 service and administrative charge per person. Additionally, all cancellations received 31-60 days before the departure will be assessed 10% of the land portion cost; 10-30 days before departure will be assessed 40% of the land portion cost; 2-9 days before departure will be assessed 100% of the land portion cost. Most tickets have value. Any unused flight coupons must be returned in order to determine refund value. Lost, stolen or destroyed tickets must be paid for until refund is received from issuing carrier, subject to an airline-imposed service charge. Group fares are based on a minimum number of passengers traveling; if the number of passengers falls below the minimum required, a surcharge may be imposed on all passengers. Cancellation rules will be given separately at time of booking. Booking fees, train tickets and issued visas are never refundable. An administrative fee of $25 per person will be charged for each change or amendment to the original reservation (e.g. change of date, land only, departure city, etc.) if requested after RUSSIAN NATIONAL GROUP has issued the written confirmation or invoice. Please be advised that due to the nature of travel in Russia, your tour may not be deliverable exactly as described (i.e. theater scheduling, hotel occupancy, unscheduled holidays, etc), BUT RNG will substitute scheduled or advertised events, hotels and restaurants with alternatives of equal or greater value and quality. RNG will supply its group travelers with personal transportation to and from all train stations, airports and ports, as described in the tour description. Tour participants should be prepared to handle their own bags at certain times during the tour. We cannot guarantee air conditioned vehicles in some cities, as they are not always available in certain parts of Russia. 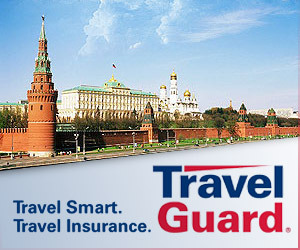 Russian National Group highly recommends that you purchase travel insurance for your trip. This may be purchased directly from us or through your travel agent. Call for details. Claims for refunds must be submitted in writing and signed by the local representative of Ground Operator, and received by RUSSIAN NATIONAL GROUP in New York within 30 days of cancellation or non-receipt of services. Refund request for absences, missed sightseeing, meals or other unused services are not granted. Airport taxes, passport and visa fees, excess baggage fees and airport & train station porter age are not included in the price of the tour. Also not included are items of a personal nature such as telephone calls, additional food or beverage items, room service, valet or laundry service, optional activities, meals or drink, and any other items not mentioned as included. All hotel gratuities are included in the price. When meals are featured, those gratuities are also included. However, gratuities for the Tour Manager, local guides, drivers and cruise staff/crew are not included and are at the discretion of the individual traveler. RUSSIAN NATIONAL GROUP Inc. acts only as an agent for airlines, bus companies, hotels and other suppliers, and as such assumes no responsibility for any omission on the part of said suppliers resulting in injury, damage, death, loss, accident or delay to persons or property. The payment for reservations on any tour/booking shall constitute consent to all provisions in the Terms and Conditions published here in. RUSSIAN NATIONAL GROUP reserves the right to resell tour space without notice if final payment has not been received by due date.Disclaimer of liability – RUSSIAN NATIONAL GROUP is acting as a mere agent for suppliers in selling travel-related services, or in accepting reservations or bookings for services that are not directly supplied by RUSSIAN NATIONAL GROUP (such as air, hotel accommodations, etc.). RUSSIAN NATIONAL GROUP Inc. ,therefore, shall not be responsible for breach of contract or any intentional or careless actions or omissions on part of such suppliers that result in any loss, damage, delay or injury to you or your travel companions or group members .Unless the term “guaranteed” is specifically stated in writing on your tickets, invoices or reservation itinerary, we do not guarantee any of such suppliers’ rates, bookings, reservations, connections, scheduling, or handling of personal effects. RUSSIAN NATIONAL GROUP shall not be responsible for any injuries, damages or losses caused to any traveler in connection with terrorist activities, social or labor unrest, mechanical or construction failures or difficulties, diseases, local laws, climatic conditions, criminal acts or abnormal conditions or developments, or any other actions, omissions or conditions outside the travel agent’s control. Traveler assumes complete and full responsibility for, and hereby releases the agent from, any duty of checking and verifying any and all passport, visa, vaccination or other entry requirements of each destination, and all safety and security conditions at such destinations, during the length of the proposed travel. For information concerning possible dangers at international destinations, contact Travel Advisory Section of the U.S. State Department. For medical information, call the Public Health Service .By embarking upon his/her travel, the traveler voluntary assumes all risks involved in such travel, whether expected or unexpected. Traveler is hereby warned of such risks, and is advised to obtain appropriate insurance coverage against them. Traveler’s retention of tickets, reservations or bookings after issuance shall constitute a consent to the above, and an agreement on his/her part to convey the contents hereto to his/her travel companions or group members.